HelloKitty TEQ Release by Quiccs x Kidrobot! I won’t lie, this release weirds me out a little. Ha. Not in a crazy bad way, just in I don’t know what to make of it. I would love to have been in the meeting room when this idea was banded around. Pulling Quiccs’ name out of the Artist Hat and Hello Kitty from the License Hat. Booom! It’s a powerful combo I rarely thought would happen. Let us introduce you to HelloKitty TEQ by Quiccs x Kidrobot! HelloKitty TEQ has all the good bits from a Quiccs TEQ release (the chunky sneakers, the TEQ hoodie), and all the cute bits from a Hello Kitty release that this somehow works. It’s much bigger than what I was expecting, standing at 8inches tall. TTC got hold of the Kidrobot exclusive colourway whilst we were over in Dallas last month and it took us a wee while to come to terms with what we were holding. 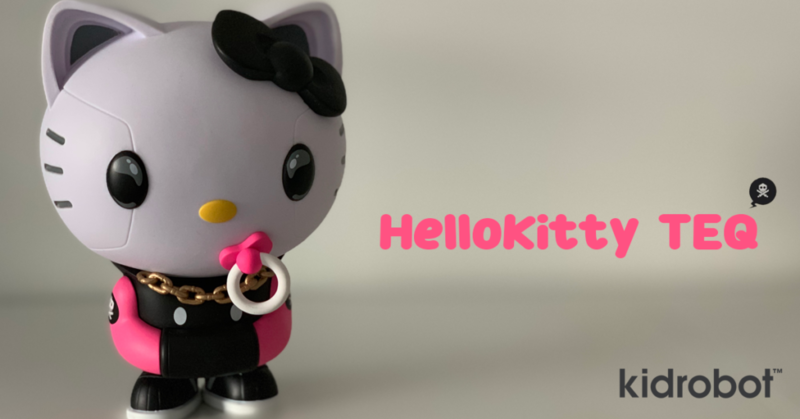 It comes out of left field and even now, a few weeks later, we glance over to see HelloKitty TEQ in our collection and go ‘WTF!’ Quiccs & Kidrobot have definitely worked on something that will make folks at least look twice. HelloKitty TEQ drops tomorrow (Fri 8th Feb at 10am MST (5pm GMT)) from Kidrobot. We are hearing rumblings & fumblings that there will be more than two colourways of this Quiccs x Kidrobot collaboration. With the OG colourway (seen below) being available from your favourite Designer Toy stores. I would check out stores such as myplasticheart, Tenacious Toys, IamRetro, Martian Toys, Strange Cat Toys, Mindzai & Collect & Display as these guys will likely stock the OG colourway of HelloKitty TEQ tomorrow. Expect to pay around $50 (£39) for this release. Kidrobot can be found on Instagram HERE, with Quiccs been found on Instagram HERE! Check it!